We can finally say Spring is in the air! We’ve been waiting so long for warm days to get ourselves out of being cooped up in the house with the kiddies! Of course, our wardrobes are just as ready as we are with all the essentials! And it shouldn’t be of any shock that each of us have found those essentials to be as different as can be! Check out what the 3 sisters have chosen as their “must have” this Spring season! Sheena’s Spring essentials are her tokens, she depends on them the entire season. She loves a classic, clean and elegant off the shoulder dress that can last her through the season and even into the summer. She found this gorgeous striped poplin off the shoulder dress to add to her wardrobe and plans on wearing it the first sign of warm weather! Spring is so moody, there is warmth, rain and sometimes even a slight windy chill, so one can never be prepared for what is to come. She loves to depend on a light layer for those mood swings and this military jacket does just the job! Sheena always has 1000 things to carry around (for what reason noone will ever know)…it’s a girl thing, isn’t it? Big bags, lots of stuff and no reason? She is loving her Henri Bendel Jetsetter Mini Convertible Canvas Backpack and wouldn’t go this season with anything else on her shoulder! It doubles as a crossbody and backpack for those days when she is either solo or in tow with her brood. 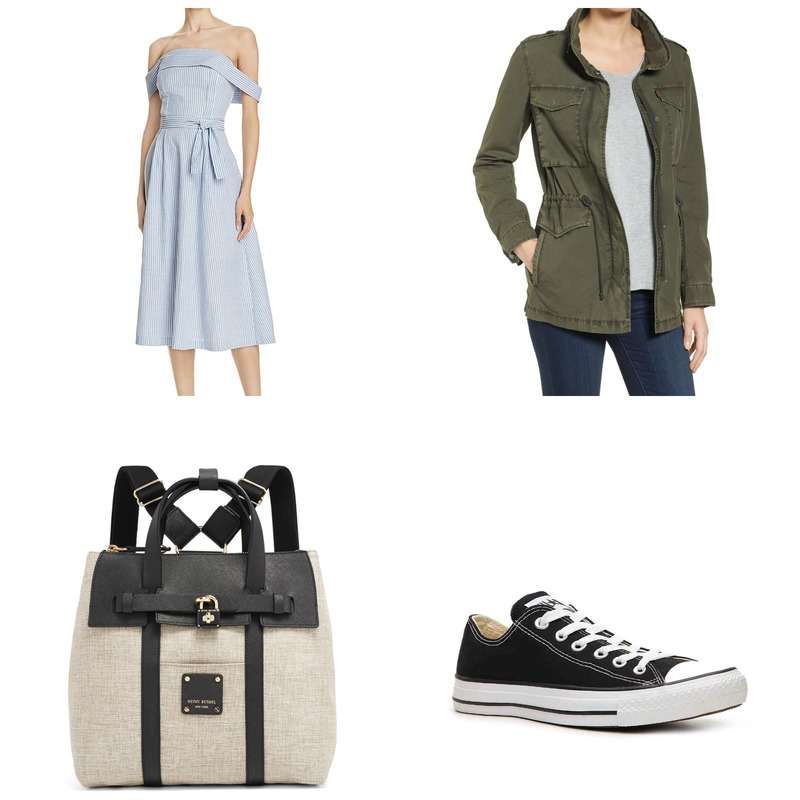 Last but not least, one of her essentials is her favorite Chuck Taylor All Star sneakers to add to her Spring look. She is always running around and doesn’t have much time for heels, so she depends on these comfortable shoes to keep her feet happy and dancing! The older Dedhia boys are ready for Spring too! They’ve been itching to get out of the house and on to their bikes and scooters and whatever else that moves them around! This year Sheena is depending on those few essentials that the boys will be wearing all Spring long. No matter where you live, you can relate to the fact that the weather has been 100% unpredictable – one day it’s 80 and the next it’s 30 with a snow storm in the horizon. Sheena plans on being fully prepared for the boys this Spring with a few must haves. She’s chosen this Light Warm Padded Vest for those random cool days that will definitely show up. It is always smart to be prepared with layers when it comes to kids, otherwise that is another tantrum waiting to happen. As the boys have gotten older, she has noticed that they are more into wearing sweatpants instead of jeans, purely for comfort reasons. She has come to terms with that and has figured, if they are going to live in sweats, they might as well be stylish, so she stocked up on these Plush Pique Trousers that will keep them comfy and stylish all Spring long! Just like their mommy, the boys love their sunglasses and so Sheena’s picked these for this Spring as simple Aviators never go out of style! They are forever loosing them, so a nice, inexpensive pair does the job for the entire season! Because these boys are forever running around and always on their feet, a solid pair of sneakers are a must! 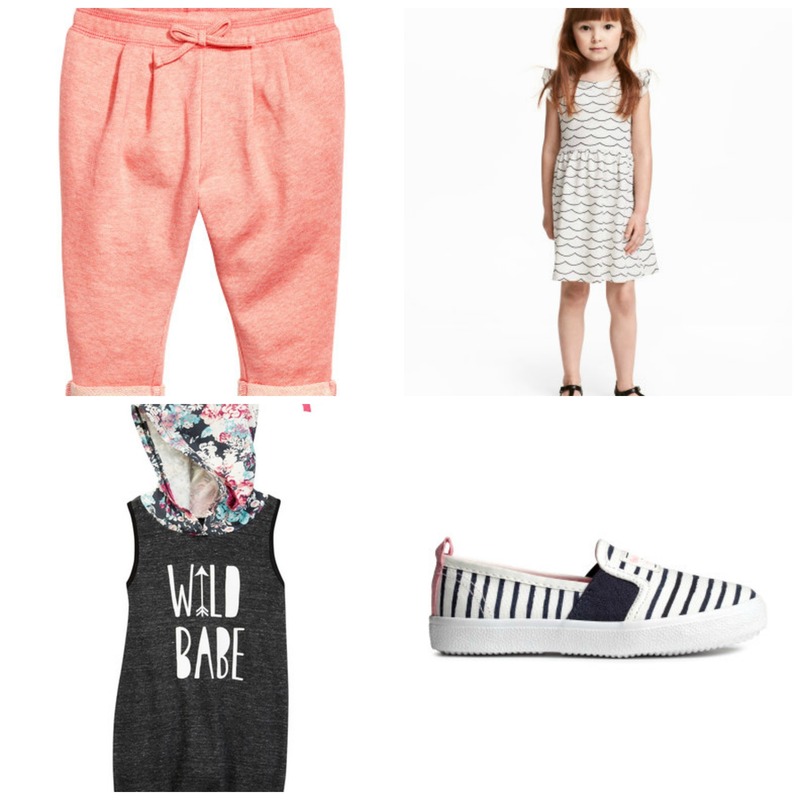 She has noticed that a comfy pair with keep them and mommy happy through the Spring and beyond! She choses these GOEX Bernie Sneakers every year as they will sustain all the running and jumping and whatever else 7 year old boys do at this age! As we know, Nina is on the verge of loosing some major baby weight that has accumulated over the years. She is working hard on dieting and exercising to reach her goals. With that being said, she is not going crazy with stocking up on her Spring looks. She has invested in some staple pieces that will pull her through the season in style. She is the queen of comfort, she choses that over trends any day of the week, so naturally her picks display just that. With her favorite jeans, she loves a cute and functional top that leaves room for movement. 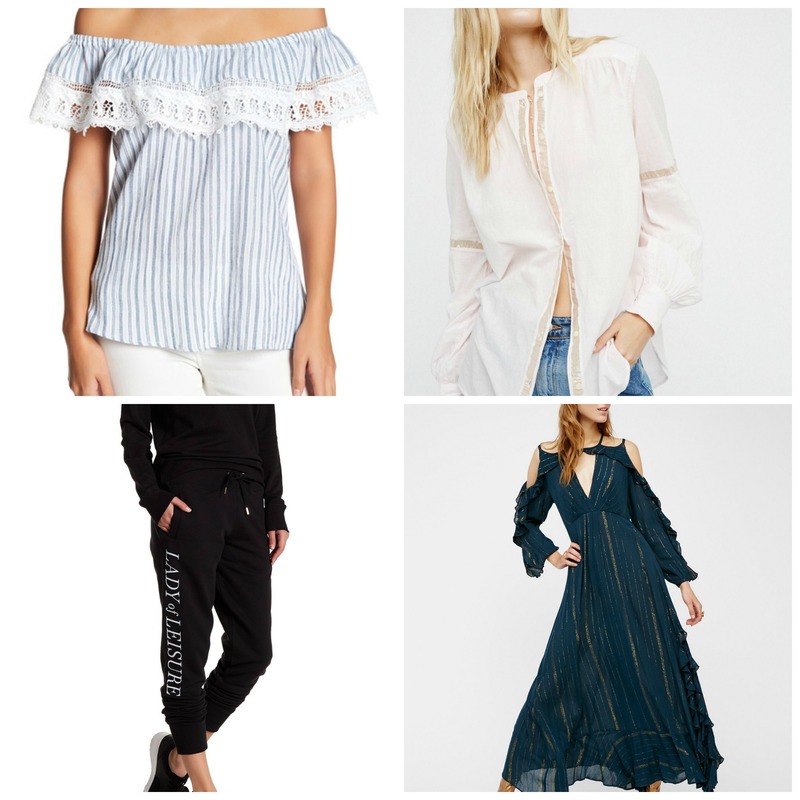 Therefore, she chose two tops that work in her favor, an off the shoulder poplin and lace top and a staple white button down with gold accents that can be worn dressed up or casual. She wanted to add a fun dress to her Spring look and loves a gorgeous sleeve, so she chose this romantic number. When at home, she lives in her sweats, so she added this pair to keep her comfy while running around after her three girls! As for the girls and their Spring wardrobes, let’s just say Sheena and Dipti are happy they don’t have to work on SO many options. Well, lucky for Nina, the comfort queen, she trickles that down onto her girls. They are always in their most comfortable clothes over fancy ones that they can barely move around in. Just like she did with her line of clothing, Nivara, she focuses their wardrobes on comfort first. Nina has the baby, whom she loves to keep in rompers all the time, as that is the easiest while in diapers, so she loves this fun printed romper with the two different fabrics to keep it comfortable and stylish. For the most part, the girls are in leggings or sweatpants just like their brothers, as this is the best for kids this age. She loves these sweats that are simple, cute and come in an abundance of colors! For the times when they like to get a little fancy (which they do!) she chose this simple cotton dress to add variety. Still comfortable but also girly! A staple for all the kids are slip on shoes! They are the easiest to take on and off and comfortable as well! She loves these striped ones for the girls! Dipti will be pregnant all Spring and her wardrobe is ready for it. She recently has fell in love with long jackets over anything and everything – jeans, leggings, dresses, you name it. It’s also the perfect item to cover that extra weight and show off the bump in the best way! She has 3 colors in this long trench jacket and literally wears them over and over again! It’s perfect for a night look on top of something fancy or during the day with the sleeves rolled up! She also just found this floral bomber jacket that she cannot get enough of! It goes on top of jeans or a dress and works to add a little something to her Spring. And to add another jacket to the mix (can you tell she’s all about the jackets this Spring?? ), she’s loving this subtle cold shoulder blazer that also works to show off just a little while covering most! Finally, since she’s still making her way around in heels, she’s decided to go with a comfy shoe that still exudes style. 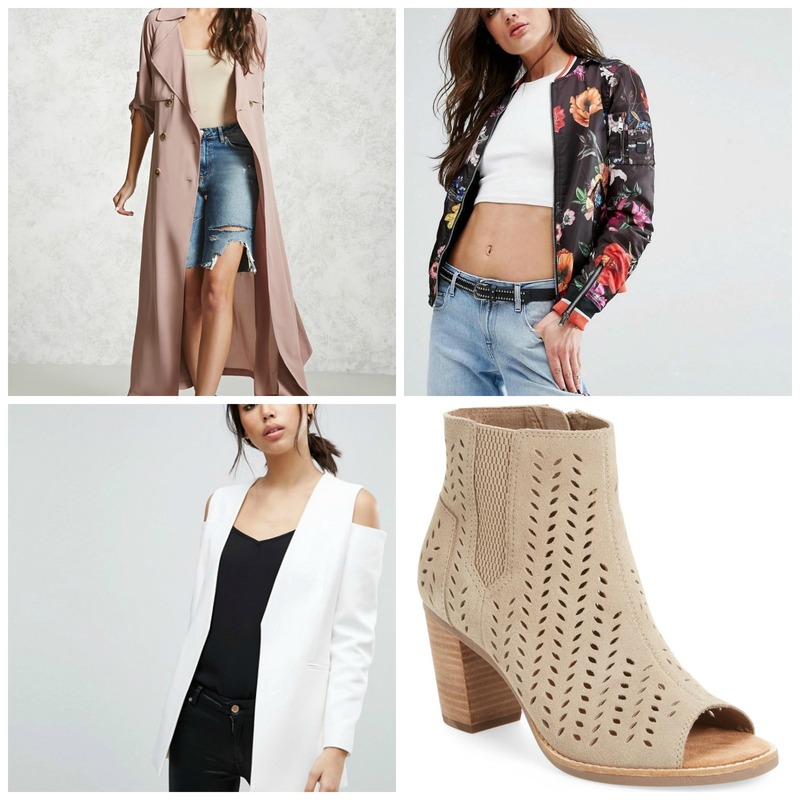 These TOMS perforated suede booties with a stacked heel are the perfect height and style to keep it comfy and stylish! Diav is still in the comfy phase so everything revolved around him being able to move and groove all day long. 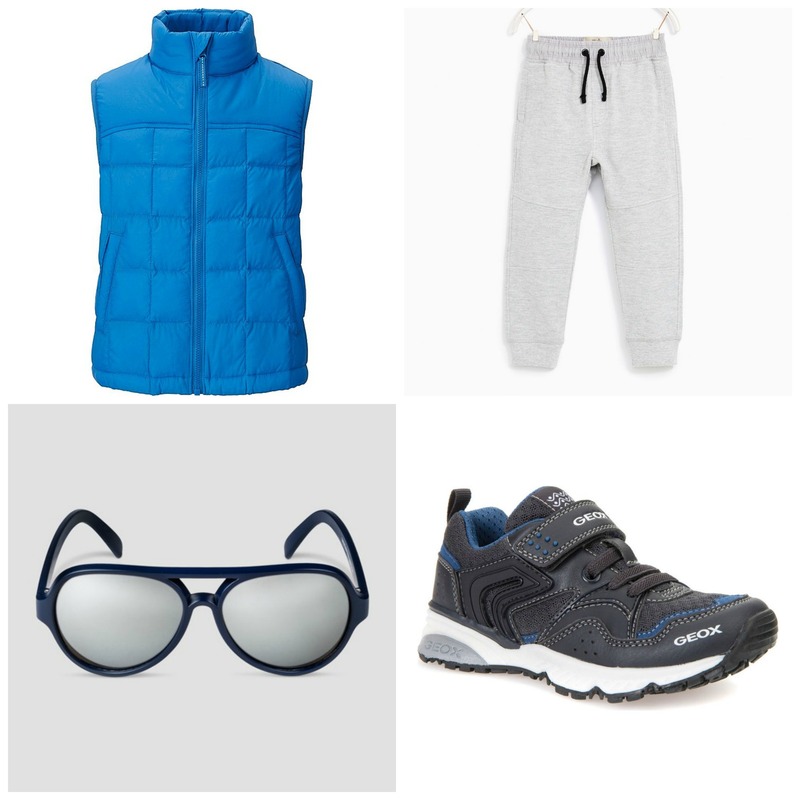 Dipti has chosen some essentials she knows will last him all season. Again, its all about the layers for this little fella! Better to be safe than sorry! Like all the other Vaid kids, he is also a creature for comfort and Dipti loves stocking up on super stylish sweatpants for him as well. She loves these as they leave a little room on top for the diaper and taper at the bottom so he isn’t tripping over himself. She adds a denim jacket to his Spring look to keep him warm when needed and styled always. D loves imitating his Daddy, so he loves wearing caps just like Daddy. Dip loved this one as soon as she saw it with the bright yellow and gingham combination. 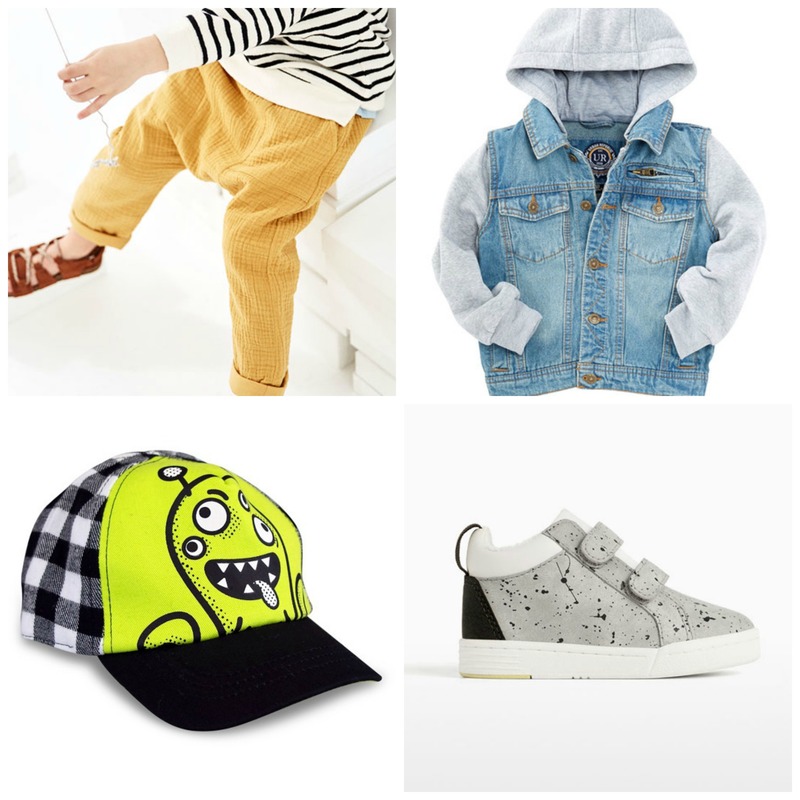 And lastly, she loves a little bit of a high top to his sneakers and definitely ones with velcro since he is nowhere near ready for shoelaces, so she added these fun ones to his season. Remember when we shared this amazing Spring Makeup Look done by our dear friend and super talented makeup artist, Marissa? Or how about our Spring Makeup Must-Haves last year? We are still loving these all these colors for this season as well!